Engineering Motherhood: Two perfect summer meals! 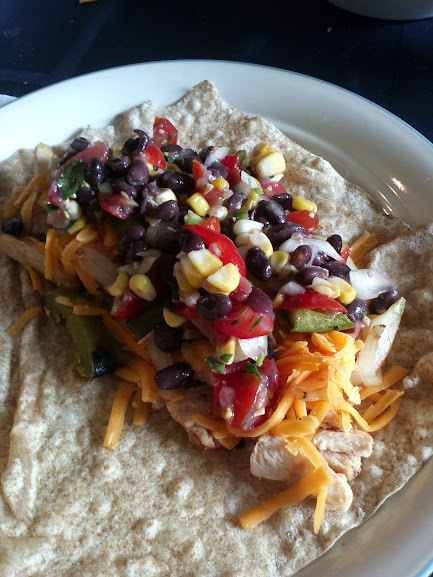 I haven't done a meal plan post in quite some time, and I don't actually know if I will continue with those now that I am heading back to work, but we recently had some very yummy means, so I thought it would be fun to share some ideas! In the summer we love to grill out for friends. John makes some great varieties of burgers, but we were having friends over who were gluten free. We thought chicken, but I wanted to fancy it up a bit, so I made shish kabobs! I simply cut up peppers, onions, and chicken and fed them onto skewers with some tomatoes from our garden! John grilled them and added a bit of BBQ sauce at the very end. I love the flavor combination and how beautiful they look! 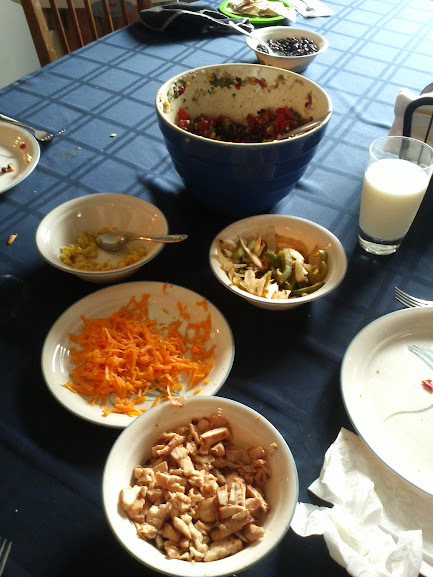 We had some leftovers from this meal and wanted to think of something interesting to do with them. Why not tortillas?! Mix well, cover, and refrigerate for at least 2 hours. Wish I could come for these fresh home grown and cooked meals! y'all should fly up here and visit!